ENDS Jan 31st: 50% off ALL group rates forever. Ryan’s phone buzzed at 5:20am. Probably another email about the church picnic they were planning. It was a reply from “the Accelerate Team”. They were replying to the email he’d sent two days ago, an email in which he’d expressed his skepticism toward book summaries and the entire concept of Accelerate in general. Note: The following contains actual emails used with Ryan’s permission. we’ve copied and pasted them below. but first -- Earlybird Deal ends in 2 days! Yes, secure my earlybird membership now! Ryan looked at the stack of 8 books he had in front of him. He was debating whether or not to open the email now or save it until later so he could focus on reading. He was still trying to practice his method of reading 8 books each week. Admittedly, it was getting harder. Taking a sip of his black coffee, he decided to open the email and began reading their response. They gave a fair answer to his question; he’d asked whether summaries hurt more than they helped. And they certainly explained themselves well, he thought. He could appreciate their likening of Accelerate’s book briefs to protein supplements. (He may or may not have had an excessive gym phase back in the day). They attached the book summary of The Problem of Pain as Ryan requested in order to compare their summary with his experience reading the book. The sun rose slowly as Ryan worked his way through the book brief and by the time he had finished, he felt as if he had read the book again. Well.. there definitely were some insights in the book that Ryan felt could’ve been included in the summary. And he probably would’ve added a thought or two to the conclusion, but all in all, it was a refreshing experience. It’d been about 2 weeks since he finished the actual book. As he read the book brief, it was refreshing to recall and reexamine the insights that had arrested him two weeks earlier. But it was equally shocking to realize how much of it he’d actually forgotten. It made him wonder — out of the hundreds of books he’d read in his lifetime, how much could he actually remember? While still doubtful of book summaries, Ryan could certainly appreciate how the book brief seemed to helped encode the insights into his brain. He felt as if the book brief further integrated these insights with his worldview, giving him a new clarity. The sunlight began filling the entire room, alerting Ryan that his morning reading hour was over. And while he didn’t get around to reading the 8 books in front of him, he suspected that the time he spent revisiting The Problem of Pain was a better investment than an hour’s worth of new information. Thanks for the response and book brief. I’ll bite and say I’m interested. But one more question..
What’s your process for creating these book briefs? We’re glad you thought so and we’re excited that you’re interested! Regarding our book brief process … it sounds like you want to know our secret sauce, huh? 😉 We’ll be glad to share. 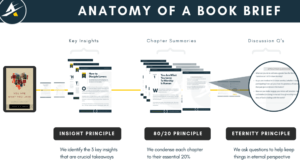 There are three ingredients to our secret sauce — three principles if you will — that guide our book briefing. These three principles can be applied to the practice of reading in general. In fact, based on our observation, almost all high-performing Christian leaders operate by these three principles, whether they know it or not. “Books don’t change people, paragraphs do and sometimes sentences,” pastor John Piper famously said. “They may lodge themselves so powerfully in our mind that its effect is enormous when all else is forgotten.” The unfortunate truth is that we will forget most of what we read. And from what we do remember, it’s often certain insights that impact us significantly. That’s why the first principle to reading effectively is identifying the key insights contained in a book. 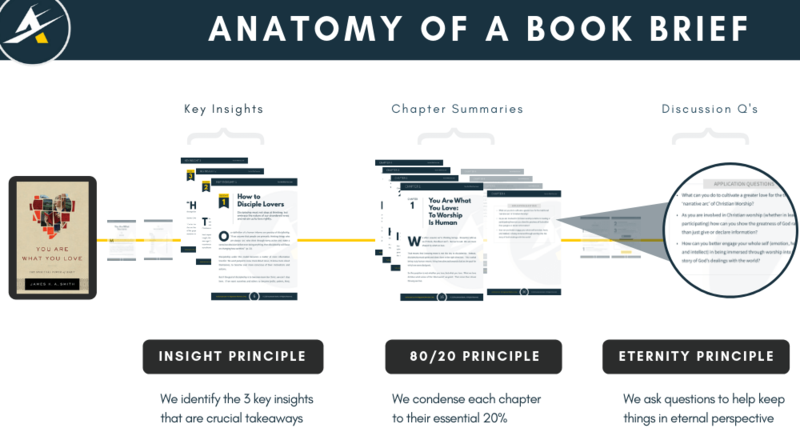 Derived from the Pareto principle which states that, for many events, roughly 80% of the effects come from 20% of the causes, the 80/20 Principle, with regard to reading, states that 80% of the key insights in a book are found within 20% of its pages. The rest of the pages serve to introduce and support these insights. Effective readers recognize this and don’t feel obligated to read every single page, especially if time is limited. This brings us to our last principle. In our next post, you’ll learn what happens when Ryan finally gets off the fence and makes the decision to invest in his learning, leadership, and team with Accelerate. We’ll share how he DOUBLED his ministry effectiveness when he supplemented his learning and leadership with Accelerate. As our Earlybird registration comes to a close, we strongly encourage you to consider signing up for Accelerate before the offer ends. If you, like Ryan, have been sitting on the fence, the time to act is now! With our 30-Day, 100% unconditional money back guarantee, there’s nothing to lose. If anything, you’ll probably fall in love with a tool that will help you and your team go further, faster. The Lord uses our moments of decision to shape our future: The future of our leadership. The future of our ministries. What will you decide to do right now? Will you continue to be overwhelmed, frantically squeezing in time to read? Or will you decide to join Accelerate and strategically maximize your leadership, your team, and your ministry in 2019? Yes, I want to maximize the effectiveness of my learning, leadership, and team for ministry.